When I received this book in the mail and found that I got to read and review this one I was excited and couldn’t wait to get started reading it. I have always been a fan of V.C. 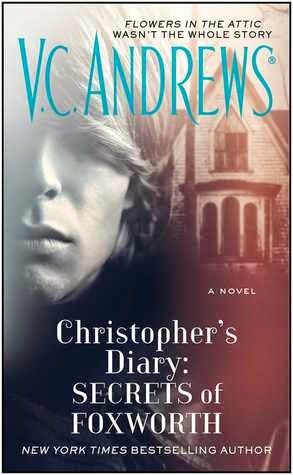 Andrews and I remember reading the Dollanganger series when I was in middle school so I couldn’t wait to read and see what “Christopher” had written in his diary. Within the first five pages I was instantly hooked and couldn’t wait to get to the really good parts of the story. I liked “Kristin” and how she seemed to how a natural curiosity about a lot of things that were going on around her and her life. Once she found the diary however, it seemed she didn’t really care about other trivial teenage things any longer. She became really obsessed with the diary and finding out more about the Dollanganger children; I knew that “Kristin” knew that she had a distant tie to the family, but she wasn’t really sure how far back. I was surprised to read at the end of the book that they were distant cousins of hers, but because it was at the very end of the book it just made me end up having more questions. I especially wanted to know that if “Christopher” and his siblings were distant cousins to “Kristin” then who was her mother to them and how far back this distance was between them. I would really like to see at least one more book be made about this part of the series and explain to family dynamics or to even introduce possible relatives directly related to the Dollanganger siblings. I liked how “Kristin” found a guy who wanted to explore things like this with her and who cared about the same things as her only because of how important it was to her.